You want a midlife career change and get a new career but haven’t taken any action? Or probably you have made some actions but stopped doing what you need to do? Let’s have a look at what you can do to keep moving and get the perfect career that you want. You want to check your personal situation and then overcome one obstacle after another to continue moving to the right direction. Let’s have a look the steps one by one. Changing careers are a serious decision. You will need to create a workable plan to get started. This means you will need to know your new career and ways to reach it. Do you know what success means to you? You will need to define success and know what success means to you. Is it a certain position or a new car or a new house? Or does it mean the chance to spend time with your family? Just have a look at your life on different fronts and you’ll be able to define your goals and all that it takes to realize the goals. If you don’t know the career you’re aiming for take career tests. But if you have already known the ideal career, you want to learn steps to make a midlife career change here. Simply use the information to create a sensible plan containing goals and strategies to follow through. 2. No daily to do list. The next thing to do is to breakdown your midlife career change strategies into a daily to do list. Make sure you create easy-to-do daily tasks so you won’t skip them for any reasons under your control. One way to motivate you to do the tasks is to rank and schedule them at your prime time. With that prime time scheduling you actually tell yourself that those items are important. 3. No system to follow through your plan. You will need to create a simple system to manage your career goal achievement. This includes a schedule for reviewing your progress and ways to revise the plan if that doesn’t move you to the right direction. For example, you may want to review your plan at the end of week, on every Sunday afternoon. Procrastination can become a huge obstacle for some people. If you tend to procrastinate find out the reasons. One of many causes of this paralyzing habit is a bad plan. A plan created in a hurry may result in a not-workable plan. When you start feeling overwhelmed by things that you have to do before reaching even a small goal, you’re likely to start postponing tasks you should do. You feel reluctant to overcome this obstacle when the demand on your time for other priorities keep increasing. If your plan doesn’t work revise it. Breakdown the tasks to smaller ones till you really think you can do them. For a task that you haven’t done before, do it using a positive point of view. Keep doing a task over and over till you feel it as a second nature. To a certain extent fears is a good emotion to motivate us into action and move forward. But too much fear can create the opposite effect, paralyzing us into inaction. If you’re experiencing the later find out what is it that you are afraid about the most? Is it financial insecurity, low starting salary or uncertain future? List and face each one of your fears. Make sure that you are being realistic about the situation and have enough reasons to believe a situation is bad. List your genuine fears and the steps to prevent your fears turning into reality. For example, if your fear is financial insecurity, talk to a career counselor and get advice about how you can prepare for a smooth career transition, financially. You may also want to ask about the worst possible scenario and the steps you will need to take for a preparation. When you started planning a midlife career change the chances of getting a new career might excite you. But not long after that, work issues, family matters and other possible reasons may take over your priority and you have forgotten about the plan. This is a life’s reality. The reality is something more pressing that demands your time and attention than your first intentions. Slowly the plan is just one of things that did not happen and you start wondering if it is ever possible for you to change your career. With that being said, how do you keep up your motivation? First, discipline yourself to follow your own system(#3). When your actions don’t show up expected results you may want to check things that work and others that don’t work. Make sure to keep focus on things that work and leave those that don’t work. 7. Lack of empowering belief. Even after careful planning, you will still face many midlife career change obstacles along the way. For that reason, don’t blame yourself for not handling the situation better. Be gentle with yourself because you are the one who has gotten yourself to this position. When you feel that your life is out of control –and you have no power to control it– you can fully control your response to what is happening around you. One great reaction is accepting the responsibility and focusing on all the positives that you derived from the situation. This is the response that allows you to add more power to your execution. 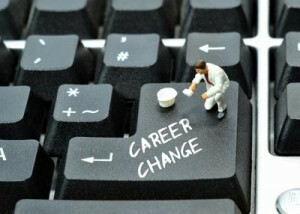 Check out this career change tutorial for creating a plan or for reviewing your existing plan. PreviousPrevious post:Career Change or Job Change?